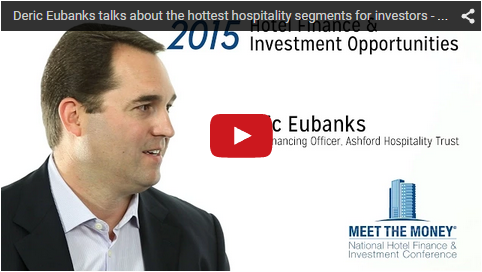 Deric Eubanks, Chief Financial Officer of Ashford Hospitality Trust, discusses why now is a great time to buy hotels, which segment provides the best opportunities, and how supply growth will affect the hospitality industry over the next few years. A transcript follows the video below. Bob Braun: Hi, I’m Bob Braun. I am a Partner at Jeffer Mangels Butler & Mitchell and I’m a senior member of our Global Hospitality Group, and I’m here with Deric Eubanks, who is the CFO of Ashford Hospitality Trust. We wanted to take a chance to talk about what you see in the market, and importantly, how Ashford is reacting to what you see in the market. Bob Braun: So, why don’t you tell me what you’re seeing and what you’ve done about it. Deric Eubanks: Okay. Well thanks, Bob. You know, we think it’s just a great time to be buying hotels in the marketplace. We’ve had a public company – Ashford Trust – for about 12 years, and Ashford Trust had a very opportunistic investment strategy to invest in full service hotels, select service hotels. We also had a debt lending platform at one time. We do a lot of mezz[anine] lending. And over time we heard from investors that they preferred to have more well-defined investment strategies. So what we did is we took the different strategies that were happening inside of Ashford Trust, and we’ve done some spin-offs. And we’ve spun off companies like Ashford Prime that only focuses on high end hotels in major markets, and we’ve announced the formation of Ashford Hospitality Select, which will only focus on select service hotels. So we’ve taken all the strategies that were happening inside of Ashford Trust and through these spin-offs we’ve broken them out into separate public companies that are still run by the same management team but it allows investors to pick and choose the strategy that works best for their objectives. And we think it’s the best way for us to compete in today’s marketplace with the opportunities that we’re seeing from an acquisition standpoint. We still think it’s a great time to be buying hotels and we’re very active on each of the platforms. Bob Braun: So, you’re very active, but is there any one platform, any one segment that seems to be particularly attractive now or particularly hot right now for investors? Deric Eubanks: You know what, it’s interesting–so on the prime side, the prime assets, the high quality RevPAR hotels in the top 5 markets–it’s very competitive to buy those hotels. There’s a lot of capital that’s chasing those hotels. There’s a lot of really uneconomic capital, like sovereign wealth funds and foreign money, that’s very difficult to compete with. The select service segment, which is where Ashford Select is focused, is pretty interesting because that’s a segment that a lot of investors and institutional money hasn’t really gotten into and there are very few publicly traded REITs that really focus on the select service segment. Ashford Trust owns about 60 select service hotels in our platform which is why we thought it made sense to basically take those hotels and have a separate strategy that just focused on those. And we think the yields are very attractive today. We’re able to buy assets at 8, 9 cap rates and you can put high leverage, cheap financing on it and get very attractive yields. So that’s a very attractive part of the market. For Ashford Trust we’re seeing assets that aren’t really in the top ten markets, maybe it’s the top twenty to thirty markets that we’re still able to buy assets at good yields and there’s not as much capital chasing those hotels. It’s getting more and more competitive out there but there are still opportunities. So I’d say the opportunities that we’re seeing are more on the select side. For Ashford Trust, sort of the really less than two times the national average RevPAR–maybe in big markets but not the top five or ten markets. Bob Braun: Maybe getting into some of the secondary markets? Bob Braun: So you mentioned that one of the things that’s driving a lot of the interest are interest rates which have been low. I remember when interest rates–where the prime rate was 18, which sort of dates me–but it still looks like interest rates are going to stay low; but is that going to have an impact on what you do and your strategy at some time in the future, whether it’s June or September or December in 2016? Is that going to have an impact on your opportunities? Deric Eubanks: Interest rates are something that we track very closely because as real estate owners we get financing on our properties, so we track debt financing or interest rates very closely. What we’ve seen over the years is that there’s a very high correlation between RevPAR and interest rates. As interest rates are going up, the economy is doing better, inflation is heating up – that’s all great for hotels. So we view interest rates really as a natural hedge to our cash flows. Our view is that if interest rates do go up, it will be because the economy is heating up, doing better, or inflation is heating up–both of those are great for hotels, so hotel EBITDA will be going up. So we don’t really see it impacting asset values that much because even if cap rates do go up, it’ll be capping a higher income number. So from a valuation standpoint it shouldn’t have that much of an impact on values. But the other side of that equation is that there is so much debt in our economy right now, which is why interest rates are so low. We think rates are probably going to stay low for a long period of time. Because the reality is, as interest rates start to go up, it makes the interest cost on all of that debt go up–which is a huge drag on the economy. I think the Fed will do whatever it needs to do to keep the economy going and I just don’t see how rates can go up that much given that. But then, also, given the fact that the dollar is now strengthening, we’re starting to see the impact in New York and some major gateway markets. Bob Braun: Let me ask you–with everything going on, and for any business generally, things seem to be hitting on all cylinders–if there’s one thing that’s sort of keeping you awake at night that makes you think that maybe something is going to happen to the party, what might that be? Deric Eubanks: The thing that we track pretty closely is supply growth. And we’ve been monitoring supply growth–the great thing about that is you know when things are going to be coming on line just because of the time line that it takes to build a hotel. It’s been surprising to us that we haven’t really seen supply growth pick up as much as you would think we would at this point in the cycle. I think one of the things that’s been driving that is the fact that spreads on hotel loans today are still relatively wide from where they were back in 2006 and 2007. So as a lender they can still get a pretty attractive yield or return on financing an existing hotel – so why take the added risk of doing a construction loan? Deric Eubanks: So I think that’s one of the things that’s really kept a lid on construction financing, which has kept a lid on supply growth–and so from that perspective we feel pretty comfortable that things are going to be pretty rosy for a long period of time. And then the question is, is there something that could impact demand growth? Really, hotel demand is going to be pretty closely tied to what’s going on in the economy. But what we’re seeing right now is even with .2% GDP growth in the first quarter, RevPAR was still up almost 8%. We’re at a period where hotels are filling up and there’s still a little bit of demand growth. Because supply growth is so low, just having a little bit of demand growth is enough to exceed supply growth which creates a great environment for hotel owners. Bob Braun: Yeah, it’s not necessarily a difficult equation to figure out that if demand is going up and supply is relatively flat then it’s going to keep things going. Deric Eubanks: Especially when hotels are full. We’re at all-time, record-high occupancies. It’s great. Bob Braun: Let me ask one thing that sort of came out of the blue last week, or maybe not so much out of the blue. When Starwood says it’s going to seek alternatives, and I come from a corporate takeover background–that means there’s a for sale sign on my business. Does that do anything to your view of life? Does that impact you at all? 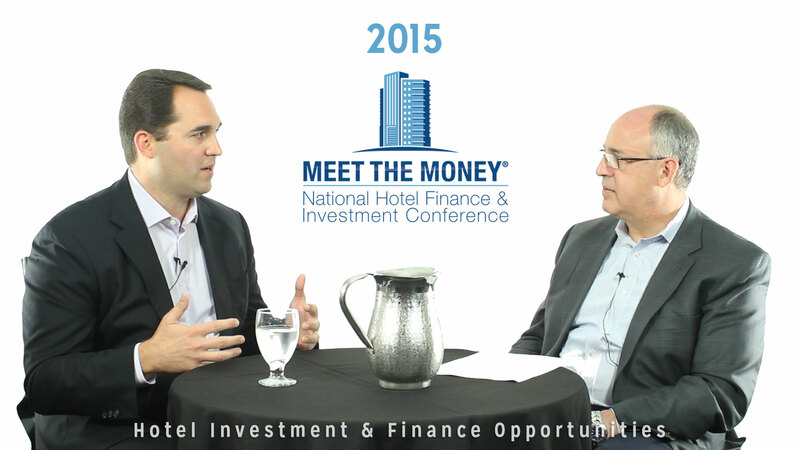 Deric Eubanks: At our history, we’ve been a very active acquirer of portfolios of hotels. We bought CNL Hotels and Resorts. That was a private REIT that sold 51 hotels to Ashford and sold about 6 hotels to Morgan Stanley’s Real Estate Fund in 2007. So, we’ve historically been a big buyer of portfolios. And Starwood owns a lot of very attractive assets and hotels. They’ve been selling those slowly over time and we haven’t bought any of those–but we’ve been looking at those opportunities, and so to hear that maybe there’s an opportunity to do something on a grander scale might be interesting to us. But what does it do to our thinking? We’ve got a lot of different brands in our portfolio. We’re one of Marriott’s largest fee payers, we’re one of Hilton’s largest fee payers. We don’t have a whole lot of Starwood product in the portfolio. We’ve got a little, but not that much. I think it will be interesting to see what shakes out. The idea of two of the big brands coming together–it’s hard for me to understand how one company having twenty brands would make sense, but it’ll be interesting to see how it all plays out. Bob Braun: It seems that they have to do something to let people know that they are thinking, and it does seem like it might accelerate going even more asset-like. Deric Eubanks: I think one thing that could be interesting for us is it sounds like they’re going to be a little bit more aggressive in growing their brands. And from an owner’s perspective, when we’re looking to either convert hotels or put a flag on a hotel–to have a brand that’s very hungry to grow that distribution, that’s something that could make the decision easier for us in terms of going with one brand or the other, if you’ve got one brand giving you more incentives, giving you some key money or a ramp in fees that can change the economics for us as owners. Bob Braun: That’s another question in that area–Starwood just announced a Tribute brand. We’ve got now Curio, and I guess Starwood’s doing it in addition to their luxury collection. Is there any specific attraction to you for these soft brands–for these secondary name brands, if you will? Deric Eubanks: The benefits to us as hotel owners is that there’s less brand requirements. We see a lot of times the brands have certain requirements that they want us to do or standards that they want us to have in our hotels that might not be a great use of our capital. Having a soft brand gives us a little more flexibility from a CapEx standpoint, to put the money where we really think it can go to work. The growth of independent or boutique-type hotels has been pretty interesting this cycle. I think some of that is just driven by where we are in the cycle. What we’ve seen historically is when we go through a downturn–and another downturn will come at some point. When you’re coming out of it, the branded hotels recover first. Those hotels start to fill up and hotels can only be full. You can’t be more than full. And then people have to start looking elsewhere. Then you’ve started to see some of the independent hotels start to fill up and do better, and that’s where you’ve seen a little bit more juice from a RevPAR growth standpoint. They’ve been increasing their market share, but the branded hotels kind of got there first. And then people had to go somewhere else, so now you’re seeing the independents kind of pick up some of that growth. But there’s definitely a segment of the traveling public that likes the more independent, unique experience–that also likes the benefit of getting their Starwood points or their Hilton points or their Marriott points. And so from that perspective, we think it could be pretty interesting. Bob Braun: And so one last question–you mention the cycle. This cycle has been now going on for a little while. It’s starting to show a little bit of maturity. Where do you think we are? Do you think we’re a year out, two years out, three years out from a downturn in this business? Deric Eubanks: You know it’s interesting, I think, I think from a supply-growth standpoint, supply-growth is going to continue to be low for a while. And that’s always been the thing that really impacts our industry in a negative way. Demand is difficult to really forecast because you just don’t really know what could happen. There could be some event that impacts demand. But what we’ve seen historically is that if there is anything that contracts demand, it bounces back pretty quickly. So we’re really more focused on the supply side of the equation, and with what’s going on in the economy. As low as interest rates are, I feel like the Fed is going to continue to do whatever it needs to do to promote growth and that’s all going to be great for our industry and our hotels. And so we’re kind of at this period where the economy is growing, but it’s not growing great enough to really spur development. Yet it’s growing enough to have hotel owners really grow their EBITDA, which is great for us. And I feel like that could continue–and we even saw that in the first quarter with very low GDP growth–yet hotels have great RevPAR growth. I think that could continue, where you see very little GDP growth but the hotel industry just continues to do very well, and that continues to push out supply growth. Bob Braun: Sounds great. Well listen, it’s been a pleasure talking to you. I really appreciate you taking the time and look forward to the rest of the conference. Deric Eubanks: Thanks, me too, appreciate it.